When applying hair products we use different methods like the praying hands method, the raking method, or even the shingle method. Here’s the thing after all of that for me (because I can only speak for myself) I find that when I lift my hair up the product didn’t really seep into my edges. So what I like to do is push my hair back in the front and apply my leave in or curly cream directly to my edges. Then I flip my hair forward and I apply my product directly to that kitchen( you know what I’m saying girl!). This is the first preventative step I take in making sure that my edges do not dry out. It doesn’t matter how busy I am moisture is key. Although making sure your product is evenly distributed is important the work doesn’t stop there. Everyday I make sure to care for my edges.I’am currently using Carols Daughters refreshing spray , however simply spraying your edges with water will do the trick. Once I moisturise my hair I go in with a light oil. I am currently using Organix’s Renewing Aragon oil of morocco weightless healing dry oil. However, whatever your go to oil is will be fine. I tend to go for light oils you don’t want to over do it. I say as long as its light and won’t weigh your hair down your fine. I spray my entire hair when I apply my oil but the key again is not to forget about your edges. What does that mean for me well it means everyday (well a day in to my wash and go) when I spray my hair with oil I don’t just mist the hair and walk away. I take my time I pull my hair up and spray my edges. Another thing that I do that is so important in caring for edges or should I say don’t do is strain it. When I say strain I mean I don’t wear any thing that is going to pull at my edges. I don’t wear super tight buns and I go out of my way not to wear ponytails that may be too tight. Here is the test if you raise your eyebrows and you get an instant headache it’s too tight boo. 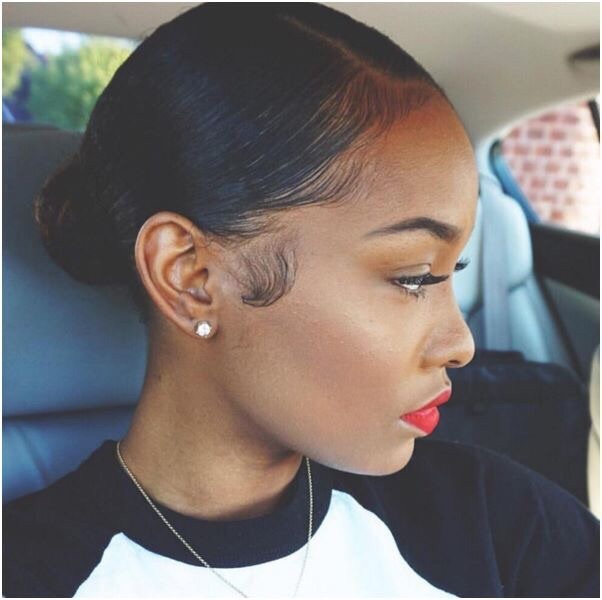 Although those tight puffs and buns may look great it does nothing good for your edges. If your into protective styles cool just don’t get your braids pulled too tight around the edges and leave those baby hairs alone. The last thing that I do in caring for my edges is take the time to have a night-time routine. At night I sleep in a loose pineapple and a bonnet or silk scarf. Not wearing your hair too tight and making sure that you have a silk scarf, bonnet, silk pillow case or any combination is key to avoiding your edges from drying out at night due to your hair rubbing against a cotton pillow case. We often forget about our edges. We pay attention to our ends we do our scalp massages and completely ignore the edges of our hair. I’ll admit it can be easy to over look, but I’m here to remind you that’s it worth it.I hope that what I do for my edges inspired you to care more dearly to your own. The edges of our hair are fragile and should be handled with care. Remember, be happy, be curly, be you, and you will never fail. This Post was posted in Hair care, Wash Day Chronicles and tagged #babyhairs, #blowouts, #braidouts, #curltalk, #curlycommunity, #curlyhair, #edges, #healthyedges, #naturalhaircommunity, #naturalhairstyles, #naturallycurly, #nighttimeroutine, #prayinghandmethod, #rakingmethod, #shinglemethod, #twistouts, #twists, natural hair. Bookmark the permalink. Reblogged this on Afro Frenzy.